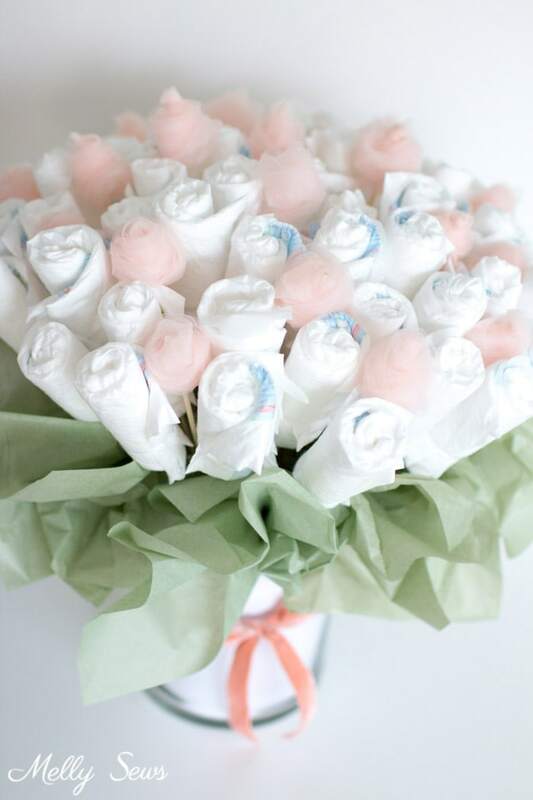 How many of you have been involved in a group hosting a baby shower? If you have, you know how things get divided up. I’m a go with the flow kind of girl in those situations, which means I take on whatever no one else wants to do. And in the case of my sister in law’s baby shower, that meant I ended up assigned a diaper cake. And flowers. And I got to thinking – what if I combined the two? 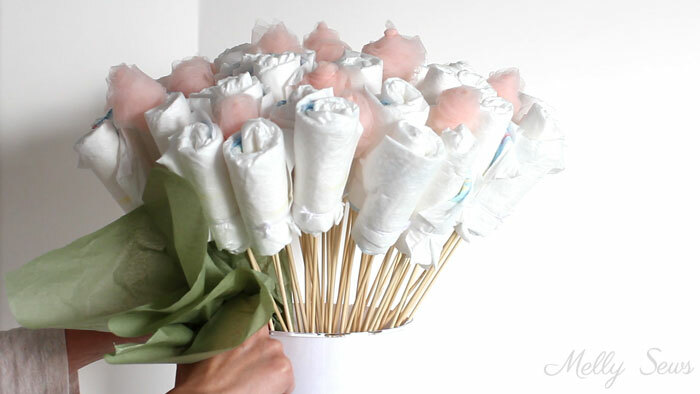 So today I present my diaper cake alternative, the diaper bouquet. 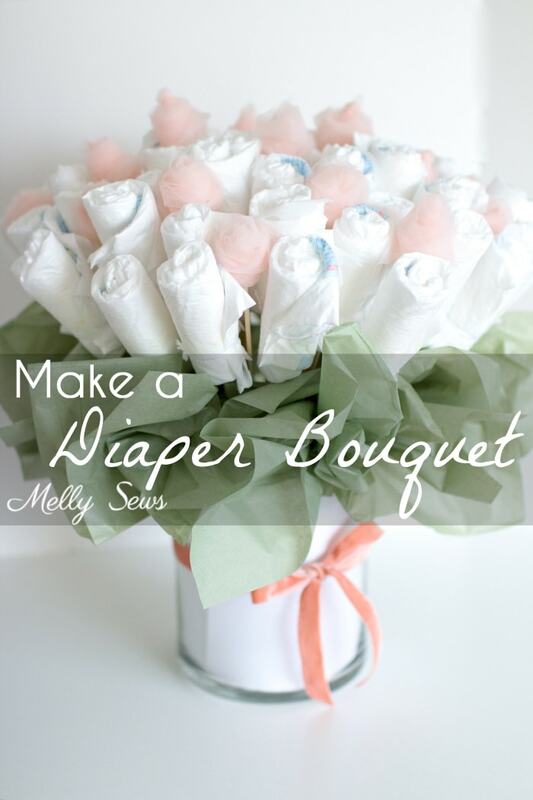 This was probably easier to make than a diaper cake, and even better, it can be set in the nursery as decor while it’s in use! Just put it next to the changing area and mom or dad can grab a diaper right off the arrangement to use. I’ve got a video of the assembly process below. If it won’t load for some reason, you can also watch it on YouTube here. And if it goes too fast for you, I’ve got a written tutorial below that. Start with the diapers, skewers, yarn and scissors. 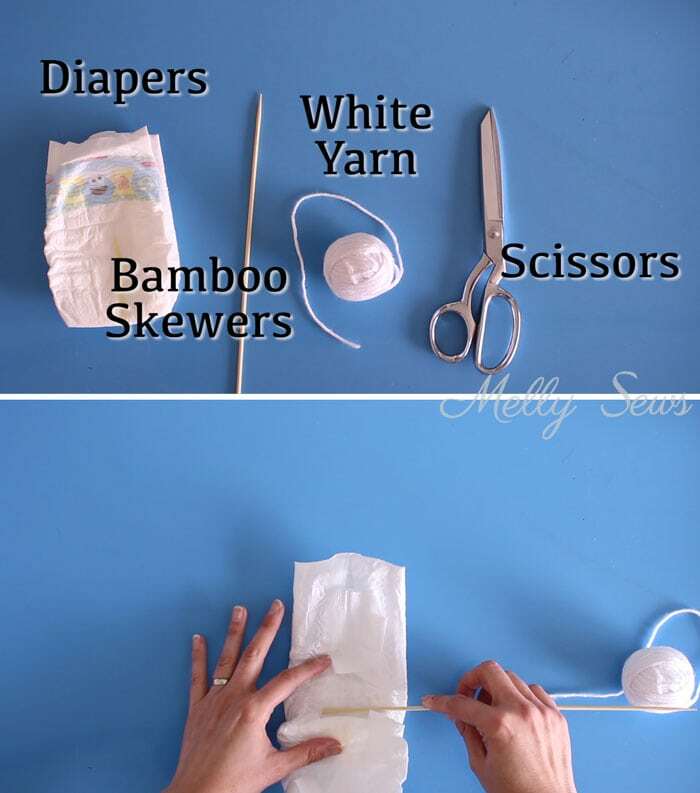 Open a diaper and place the blunt end of the skewer (if it has one) inside the diaper. I put the end of the skewer under the leg elastic, but if your skewers are pointed on both ends don’t do that because you’ll rip the leg elastic. Close the diaper and then roll it tightly, from the folded end toward the open end. Tie the rolled diaper tightly and cut the string. Line the vase with paper around the edges if your vase isn’t opaque. I just used white printer paper, but you could use cute scrapbook paper if you have some. 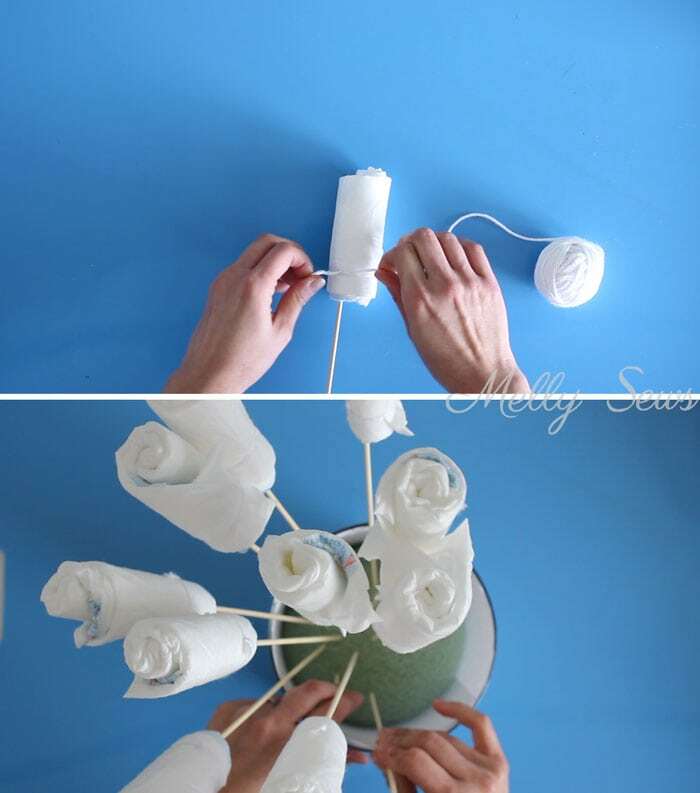 Place the foam inside the vase, then arrange the diaper “flowers” in the vase, poking the sharp ends of the skewers into the foam. Next, take the tulle ribbon and cut it into lengths of about 3-4 feet, so that you have about 20. Tie one end of each piece of tulle around a skewer, then roll the tulle around the skewer, twisting it as you go to add volume. Tuck the end of the tulle into to the pouf securely; you can use hot glue to help if you need it. 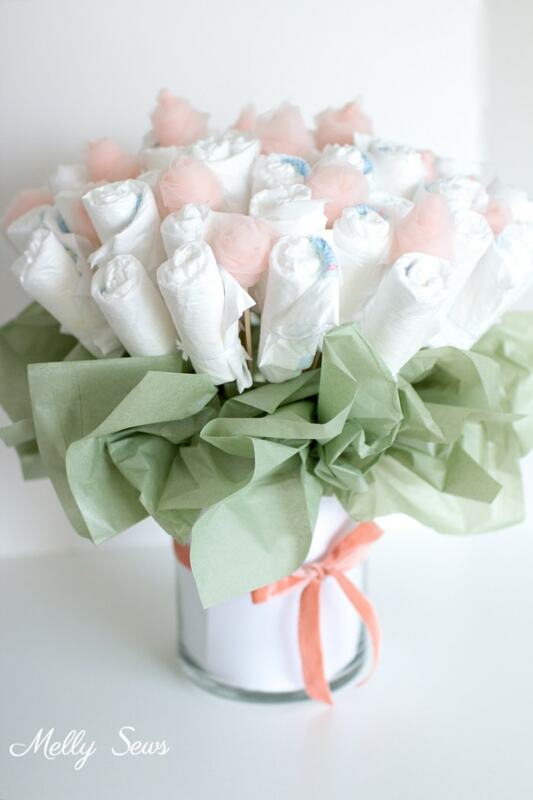 Arrange the tulle pouf flowers among the diaper flowers, filling in the holes in the arrangement. 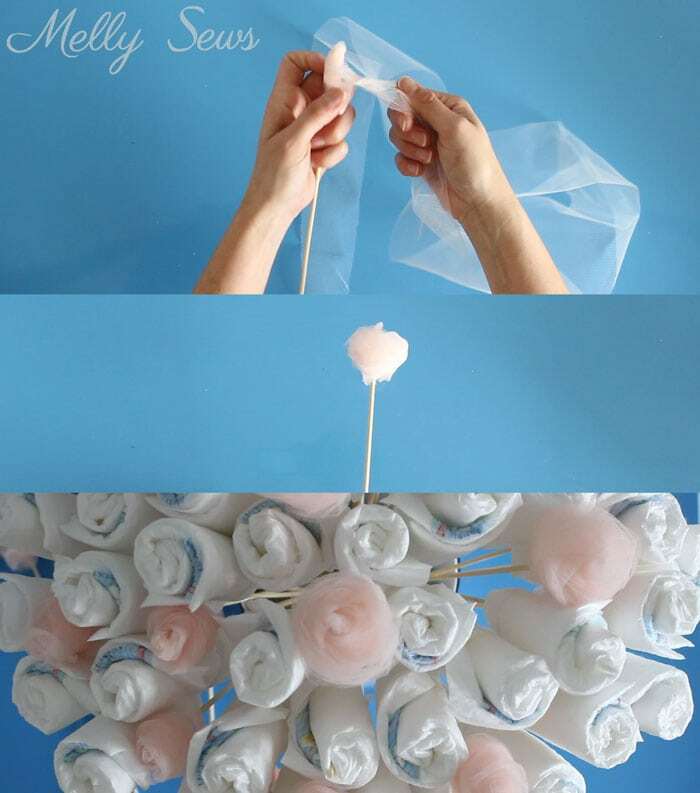 Finally, add tissue paper “leaves” to hide the skewers. If desired, tie a ribbon around the vase and you’re done! I love it!! Now I know what to make for my daughter-in-law who’s expecting their second baby this summer. So cute. Walmart sells art/craft sticks with no sharp ends fairly reasonable as an alternative to skewers. But what a great idea!